32,625 unique visitors since July, 2015. Join Me at “DevOps in the Burbs” on February 2nd, 2017. Here’s to a Successful First Year! Let’s just say that I had a situation where I was calling a third-party API to return valuable information, but that third-party service occasionally failed. What I discovered through recursion is that 1 out of every 3-5 calls succeeded, but it wasn’t guaranteed. Therefore, I couldn’t simply wrap my core logic in a hard-coded iterative loop and expect it to succeed. So, I was relegated to either coming up with a way to write some custom Retry logic to handle errors and reattempt the call or locating and existing third-party package that offers this sort of functionality as not to reinvent the proverbial wheel. Fortunately, I stumbled across a .NET NuGet Package called Polly. 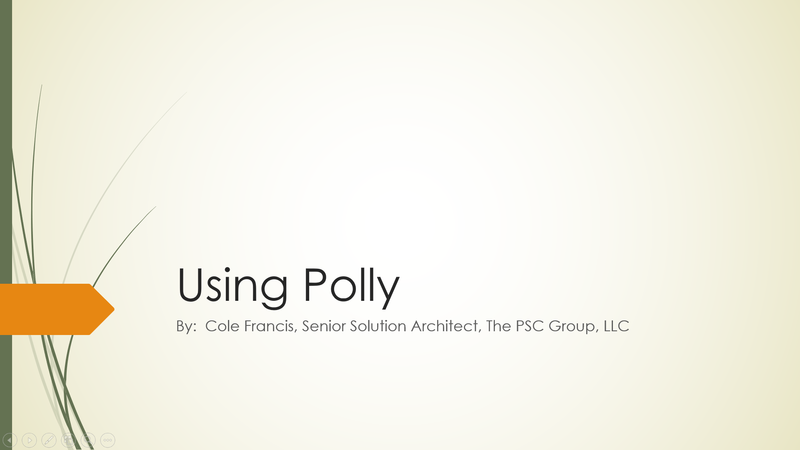 After reading the abstract about the offering (Click Here to Read More About the Polly Project), I discovered that Polly is a .NET compatible library that complies with transient-fault-handling logic by implementing policies that offer thread-safe resiliency to Retry, Circuit Breaker, Timeout, Bulkhead Isolation, and Fallback logic, and in a way that is very easy to implement inside a .NET project codebase. I also need to point out that Polly targets .NET 4.0, .NET 4.5 and .NET Standard 1.1. // Here is my wait and retry policy, with 250 millisecond wait intervals. // It will attempt to call the API 10 times. // Your core logic should go here! // then Polly will wait 250ms and try again for a total of 10 times. Retry – I just described this one to you. Circuit Breaker – Fail fast under struggling conditions (you define the conditions and thresholds). Timeout – Wait until you hit a certain point, and then move on. Bulkhead Isolation – Provides fault isolation, so that certain failing threads don’t fault the entire process. Cache – Provides caching (temporary storage and retrieval) capabilities. Fallback – Anticipates a potential failure and allows a developer to provide an alternative course of action if a potential failure is ever realized. PolicyWrap – Allows for any (and all) of the previously mentioned policies to be combined, so that different programmatic strategies can be exercised when different faults occur.